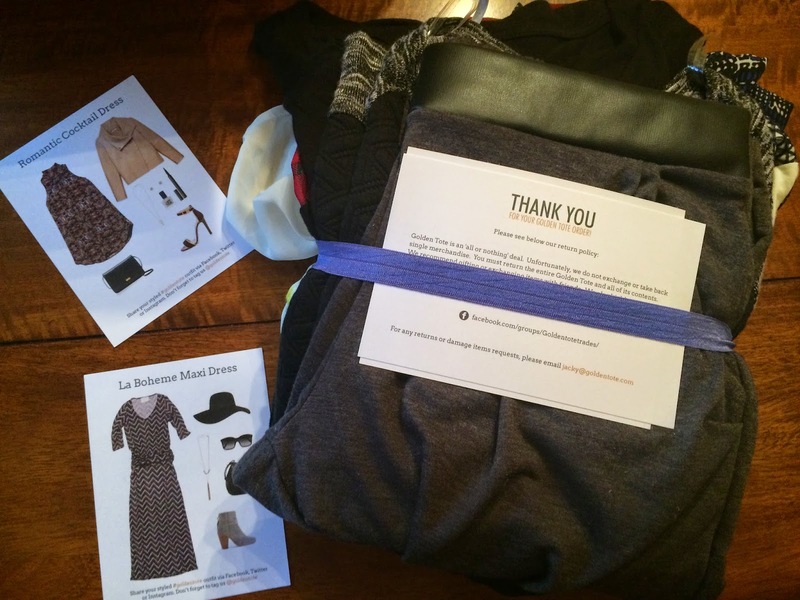 I received my September Golden Tote this week and I couldn't wait to see what my surprises were. I also love that they have been changing their tote bags so often. For this month, they actually created 2 designs, one has leaves all over it and the other had wheat stalks on it. I really liked both of the designs, and didn't want one design over the other. I'm happy with the leaf one I received! This month Golden Tote also changed their packaging slightly. 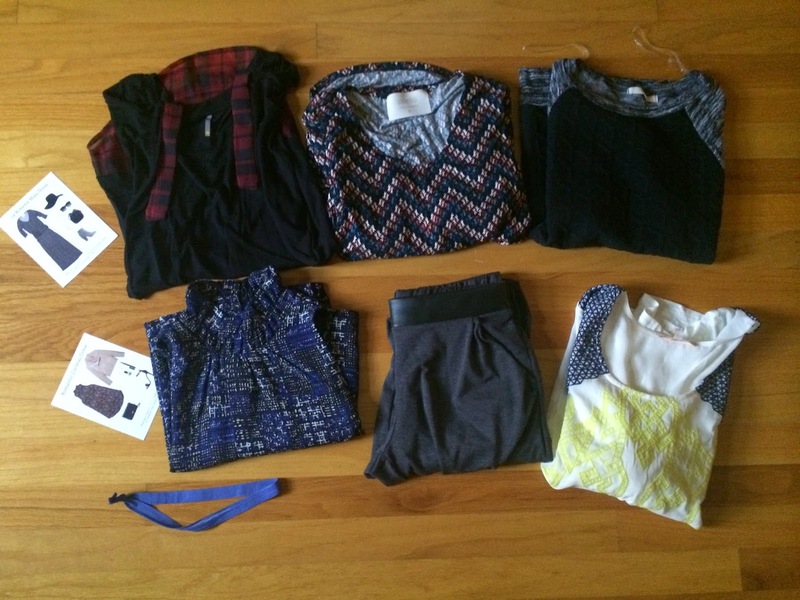 Normally everything comes in plastic bags, but now the clothing is folded together and wrapped in a headband, which is a very cute idea. And then the items are placed in the tote bag. It felt more like opening up a gift and more special, for some reason. Like someone had to actually think about what they were choosing for me and fold them up and wrap them together, instead of just grabbing some bags of clothes and putting them in a tote. I really like the changes this month! Now onto the clothes. Here's what I received in my tote! 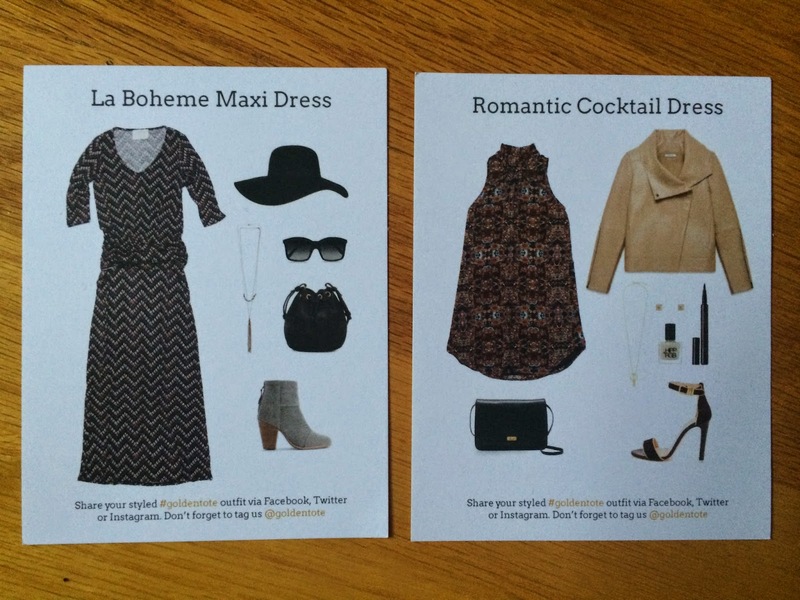 Golden Tote always includes style cards for the items you chose for your tote. I ordered a $149 tote this month and was able to choose 2 items. 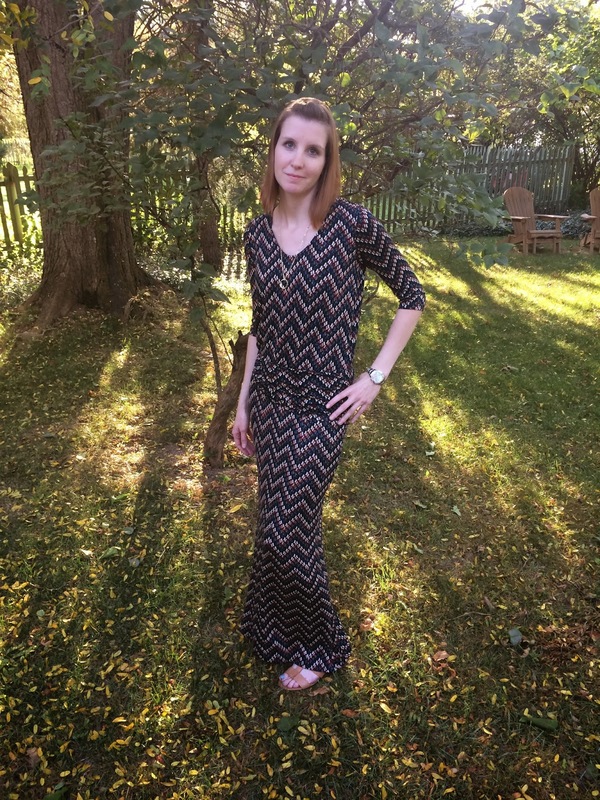 My first choice was this Puella maxi dress in a chevron print. This was the one item I knew I had to have, and surprisingly it wasn't that popular until people started receiving their totes and trying it on! It is now sold out in this print, but can be purchased in a tile print, which is still very nice. When I tried this on I loved it immediately! Puella items are so effortless and comfy and just pretty. I can throw this on and look pulled together. And I can't wait to style it with boots and cardigans for the fall. The print was different than I expected in person, but I love it so much! This was my favorite item in my tote!!! The next item I chose was also Puella. It's a Puella cocktail dress in a blue print. I love how this is different from the dresses Puella usually offers. I do not own any high necked dresses, so I knew I wanted to add this to my wardrobe, plus I loved how flowy and pretty it was! 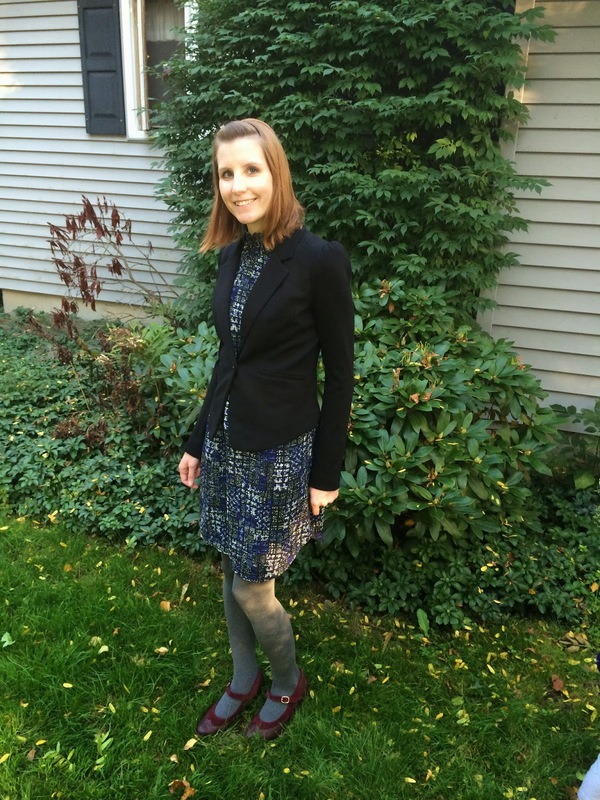 This will be great any time of year, but I'm looking forward to wearing it with tights and boots and a black blazer. My first surprise item was something I had requested. 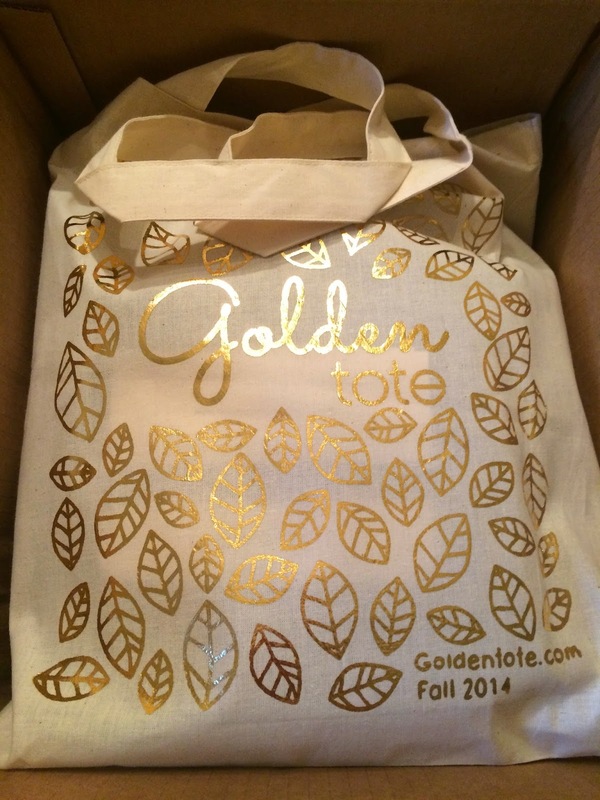 Golden Tote released a few spoilers for surprise items and this was one I knew I had to have. It's a Skies are Blue blouse. I love the yellow and blue embroidery and it's different from anything I currently own. It is very comfortable and will look great dressed up or down. I was very happy they included this in my tote as I had requested! I love it!!! The next item was a Le Lis sweatshirt. They sent me a size medium in this shirt (though I'm normally a small) and I'm so glad they did. I like my sleeves to be long and these are slightly shorter than I prefer and I can only imagine how short they would have been with the small. 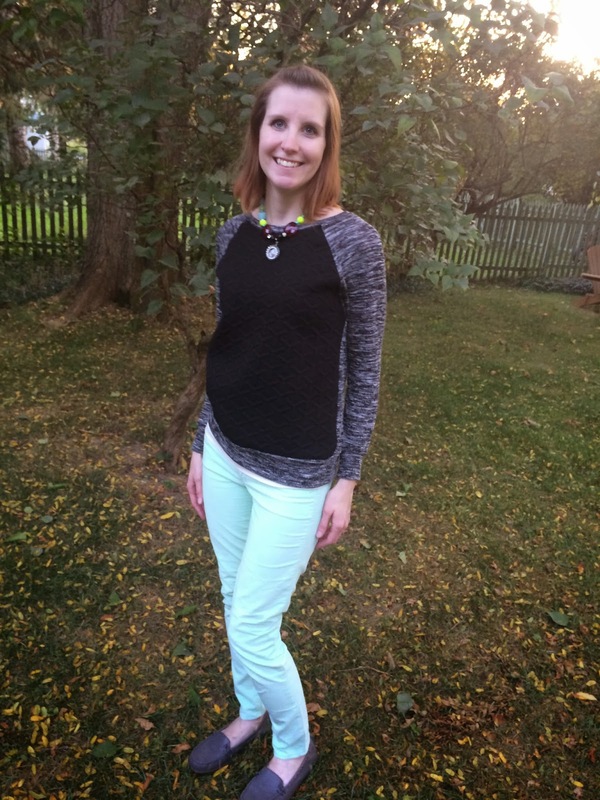 This is very comfortable and I love the color combo I received! This was by far my favorite from all the ones I had seen. And I'm happy I was sent the medium, so it fits me the way I like. The black part is quilted, which makes it unique and different from anything I own. I think I'm going to try to wear this dressed up and casually, because it's just that cute! 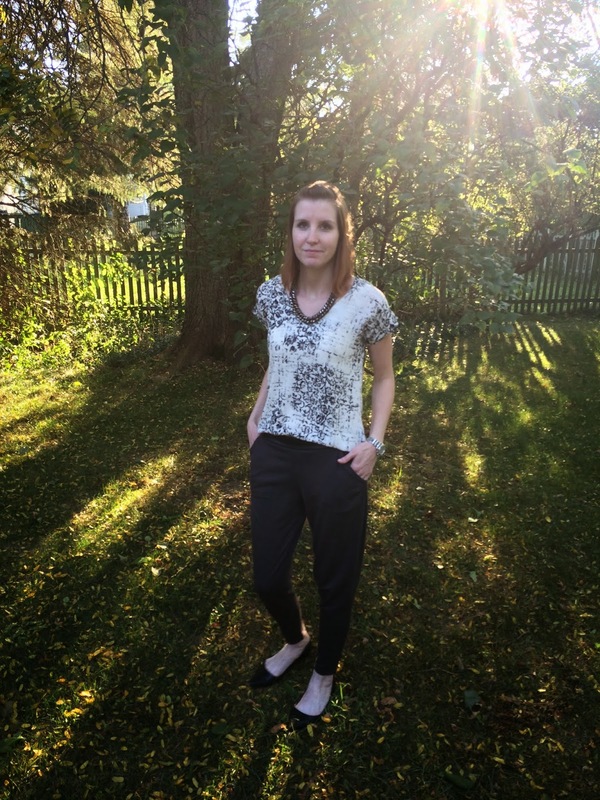 I also received the Priddy pants with faux leather waist band in charcoal. These are so comfortable! They fit like ankle length and I'm 5'6". I was so happy I received the charcoal color. It was the ones I liked the best and was hoping for. I think I'll be getting a lot of wear out of these with blouses and blazers and cardigans and everything! 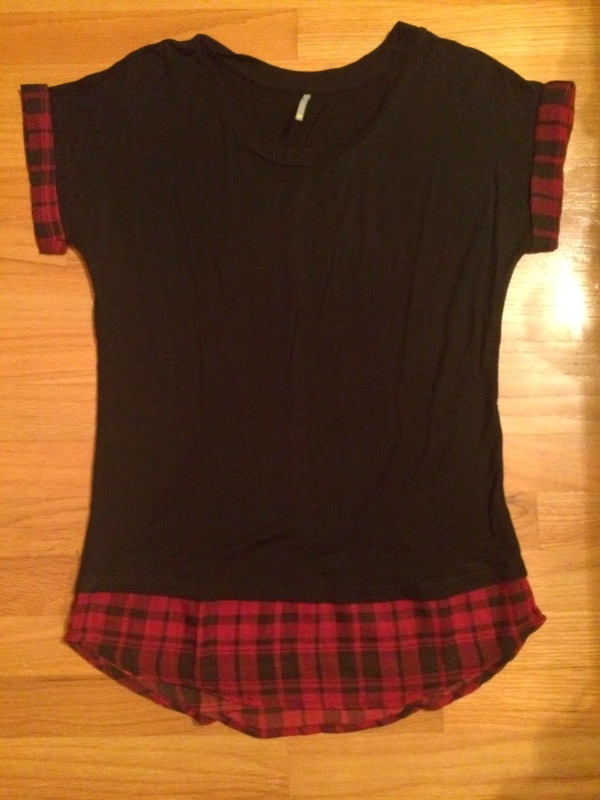 The final item I received was a Color Thread tee with red plaid. This shirt was so comfortable, but was not me at all. I couldn't see myself wearing it and really didn't feel like myself when I had it on. I knew I had to trade it, so this shirt went off to a better home. I will just post a picture of what it looked like, but do not have a styled picture of it. It was comfy and cute, just not me. And since there are always surprise items that I don't get in my tote, but have to have I end up purchasing items from the Golden Tote Trading Group. This month I tried to refrain myself and not buy too much, though there is a red and tan Aztec print promesa skirt that I can't stop thinking about and may have to break down and buy from someone. 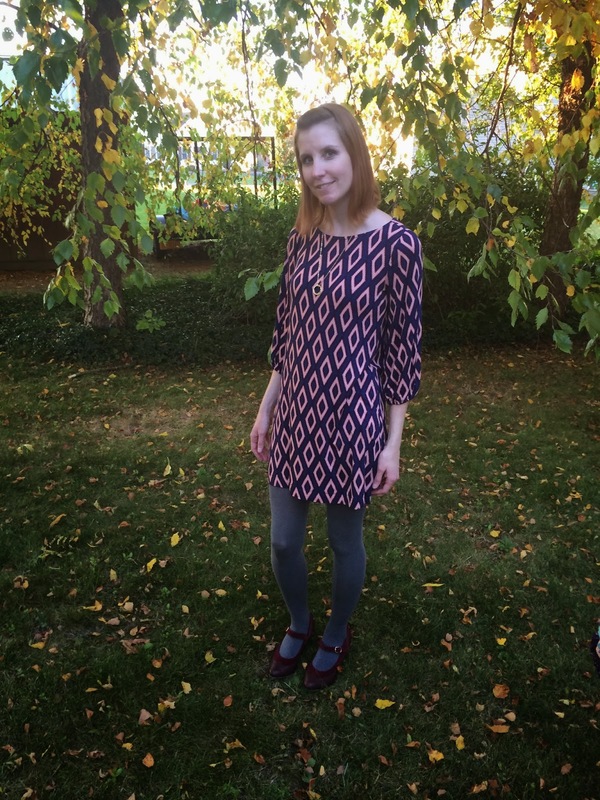 Another item I couldn't resist this month was this Hourglass Lilly dress. I feel like it has a 70s vibe to it, but I fell in love with the color and everything about it. It's very soft and comfortable and I can wear it belted or not. 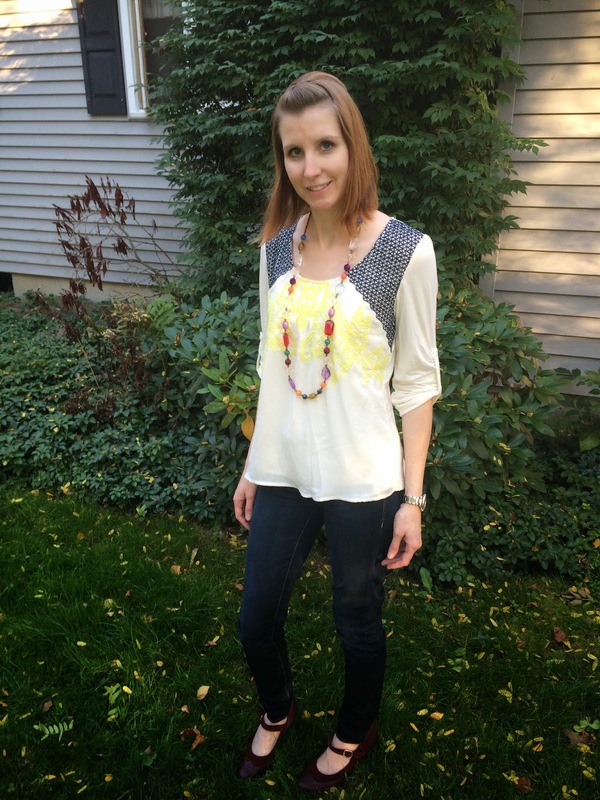 It will be great with tights and boots in the fall or cute booties. I can't wait to wear this styled in so many ways. It's very short, so it would also work with leggings. My September Golden Tote was a hit with only one item that I wasn't crazy about. I can't wait to wear everything!